An exhibition is presenting an in-depth look into the extensive career of Rut Bryk (1916–1999) who was one of the central figures in Finnish post-war art and design. With her works that convey incredible powerful emotion and intense sensitivity, she was a reformer of modern ceramic art. Her early colourful narrative works were followed by a period monumental works with a strong sense of spatiality and close kinship with architecture. 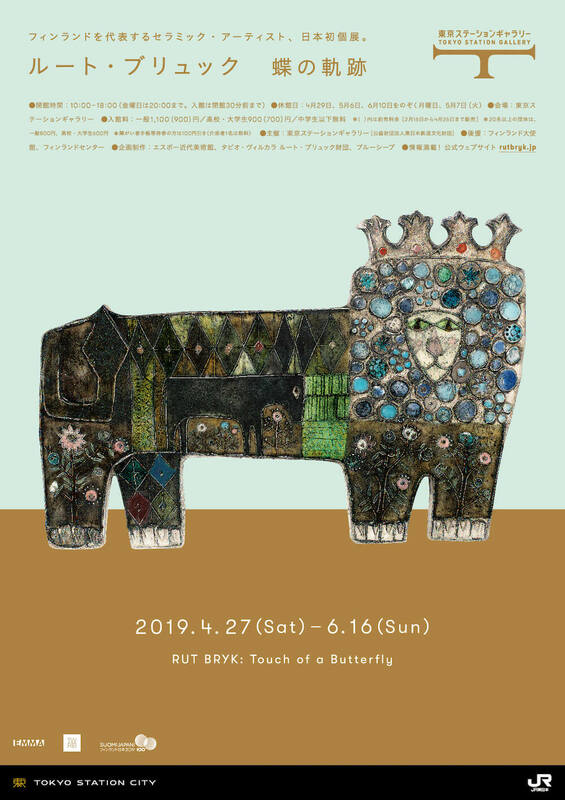 Rut Bryk exhibition, which is the first time in Japan, is divided into five sections. Most of the 200 exhibits are from the Tapio Wirkkala Rut Bryk Foundation Collection, which is deposited at Espoo Museum of Modern Art in Finland. The exhibition is produced by EMMA – Espoo Museum of Modern Art, Tapio Wirkkala Rut Bryk Foundation and Blue Sheep. Rut Bryk (1916−1999) was an internationally acclaimed Finnish pioneer of modern ceramic art. In a career spanning five decades, she worked in the art department of Finland’s famed Arabia ceramics factory and held numerous exhibitions around the world. Originally a student of graphic art, Bryk began her career as an illustrator and textile designer. Although she had prior experience with ceramics, in 1942 she received a surprise invitation to join Arabia’s art department. The artists working at the factory enjoyed great creative freedom and the support of skilled professionals and laboratory technicians. There Bryk began her long, colourful career in ceramic art, initially as a designer of decorative motifs for ceramic items by other artists. From early on in her career, Bryk exhibited extensively outside Finland, winning the Grand Prix at the Milan Triennale in 1951. Her ceramic plaques of that time featured motifs such as still lifes, childhood memories and family themes. In the late 1950s her work grew more structural and spatial. Experimentation with glazes and the imaginative treatment of colour were a signature feature of her ceramic art. Colour harmonies also play an important role in her textile designs, another field in which she made an accomplished contribution. In the 1960s her ceramic works grew to monumental proportions, each relief laboriously pieced together from hundreds, thousands, and ultimately tens of thousands of miniature tiles. In 1945 Bryk married Tapio Wirkkala, a famed designer and sculptor renowned for his boundless skill and imagination. Wirkkala was a great supporter of his wife in all her creative endeavours. The couple shared a love of early Renaissance art, a passion that Bryk inherited from her childhood home. On their first trip together they travelled to Italy, which over the years became important wellspring of creative inspiration and beloved place to work. Another cherished spot was their wilderness retreat in Lapland, where the couple spent every summer working on their art and enjoying family life. 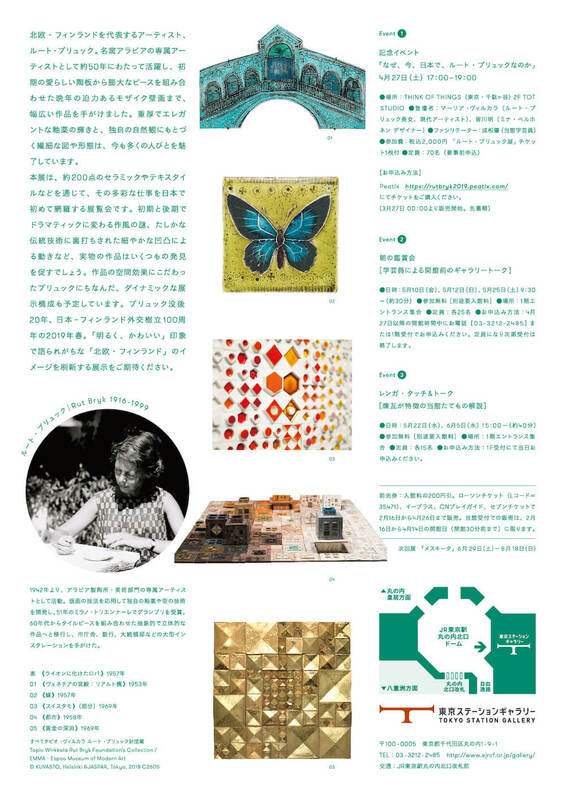 The Rut Bryk – Touch of a Butterfly exhibition consists of five ‘chapters’. There are roughly 200 works on display, the majority of which are from the Tapio Wirkkala Rut Bryk Foundation Collection (TWRB), which is deposited at the EMMA – Espoo Museum of Modern Art. The content was curated by EMMA and the museums hosting the tour. The exhibition additionally features Mind Mosaic, a “biography without words” created by Bryk’s daughter, the contemporary artist Maaria Wirkkala. The tribute is assembled from original ceramic elements used by Bryk throughout different stages of her career.